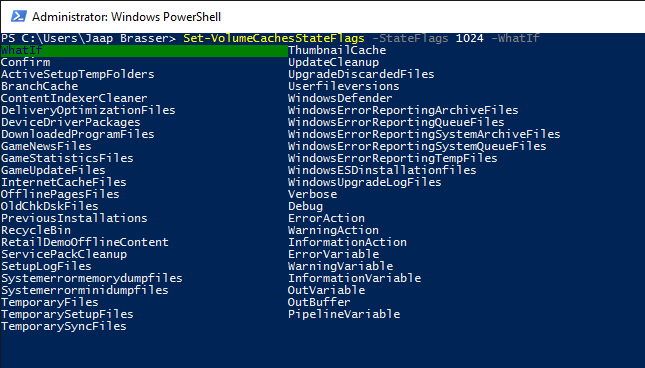 Over the last few weeks I have upgraded and reinstalled a number of Windows 10 machines and as part of my routine after an upgrade to a later build of Windows 10 I would clean up both the Upgrade files as well as the old version of Windows. The steps to do this involves starting the Disk Cleanup tool, with Administrative credentials, and clicking through the interface in order to clean up the files and save up some of those precious GBs of storage space. After repeating this process a few times in the past week it started to become a bit tedious. This will code will first create two registry keys and after creating those registry keys, specify the Disk Cleanup application to run with job number 1337. This worked, although unfortunately it is not possible to hide the GUI completely as user interaction might still be required. In certain scenarios you will be prompted to confirm that you really do want to delete the Old Windows Installation files, that includes the warning that deleting those files will not allow you to roll back to an older version of Windows anymore. This also includes the files if you upgrades from Windows 7/8.1 to Windows 10. This will both create the job with number 1337 and then execute that job, and the Disk Cleanup Windows will appear on your screen. This process can take a few minutes depending on the speed of your system. The function will wait until all Disk Cleanup windows have been closed and then show a report of the amount of space saved. I will actively maintain this module, so feel free to leave a comment or feature request in the comments or send in a pull request on GitHub. 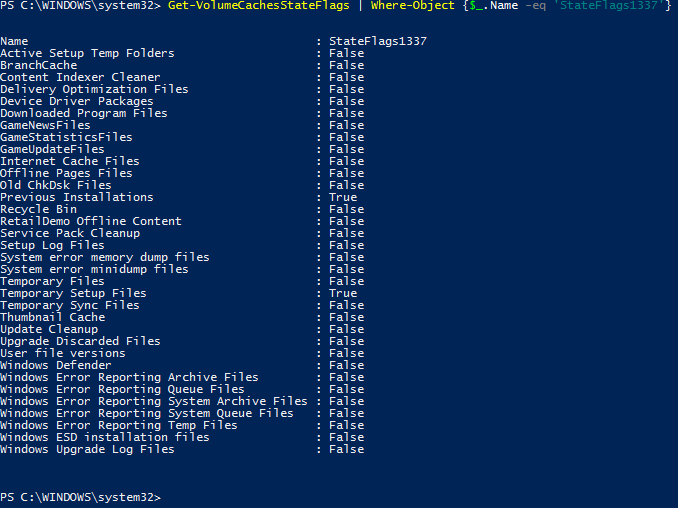 This entry was posted in Microsoft, PowerShell, Windows 10 and tagged DiskCleanup, Get-VolumeCachesKey, Get-VolumeCachesStateFlags, GitHub, PowerShell Gallery, PowerShell Module, Remove-WindowsUpgradeFiles, Set-VolumeCachesStateFlags, TechNet Script Gallery, Windows 10 on 2016-05-03 by Jaap Brasser.